Human Resources leadership at a global manufacturing company recognized that to achieve the long-term goals of their department and the organization as a whole, they needed to proactively pursue a focus on the people side of change. While the organization had a history of project management success , growing success led to significant growth goals with very big people implications. The leadership team within Human Resources knew that a change management capability would be necessary to accomplish the organization’s overall goals, yet they also knew that much of the organization was not yet ready to begin building this capability. In light of this, the department focused first on building an internal department change capability while also preparing for an eventual enterprise-wide capability build. To create a change management capability in the Human Resources department, and ultimately organization-wide, to proactively support new strategic goals and growth. With Prosci as their chosen methodology, the Human Resources team purchased a Prosci Site License that gave them access to the Prosci Guide for Managers, the book ADKAR: A Model for Change, and two role-based training programs. The Human Resources team also used the structure of Prosci’s role-based training programs and the support from Prosci’s enterprise change management suite of tools to create a plan for how they would embed change management into their organization. This enterprise plan included recommendations on who should receive change management training and how they could integrate individual change management capability into project expectations and employee reviews. The most important part of the preparation process, however, was gauging the readiness of the organization to implement a change capability. By having a plan in place for an eventual enterprise capability build, the Human Resources department could launch a deployment plan as soon as the rest of the organization seemed ready. Through the change management capability build, this manufacturing organization has accomplished an organization-wide shift in company culture. This in turn has resulted in projects with high employee engagement, less negativity, and more project success. 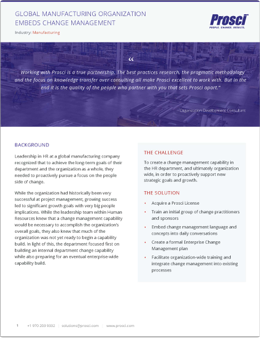 Learn how this manufacturing organization succeeded at deploying change management organization-wide, and learn about other important outcomes from building a change management capability. Download the full story as a PDF.